Bring the excitement of this casino favorite to your Windows Phone! 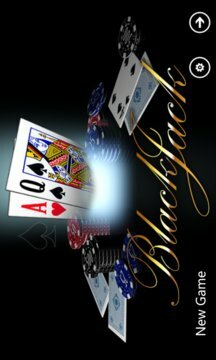 For players who are looking to improve their game, or for those who are looking for entertaining casino-like game play, Blackjack is fun for players of all skill levels. 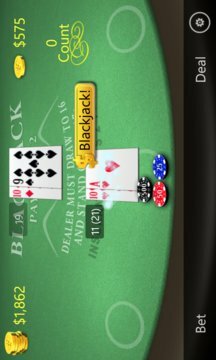 Includes multiple options such as, Dealer hits on Soft 17, Number of Decks, Show Scores, Show Dealer Card and much more to make each game unique and tailored to your game play style. Earn achievements as you play, can you get all 200 points? • Achievements and HI Scores. • Hit, Stand, Double, Surrender, Split and Insurance capability. • Learn to Play mode - displays the basic optimized strategy.